In certain respects, I'm surprised that publishers can come up with any new way of presenting books about animals to kids. When this new title arrived in my mailbox, I wonder if we weren't just adding 101 Animal Babies to the line-up. 1. Big, colorful (in-focus) photographs of a wide-variety of animals. 2. One (healthy) paragraph of interesting information about each animal. 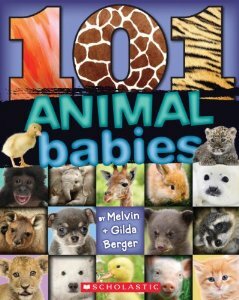 101 Animal Babies does seem to meet all of my criteria and thus I have only positive things to say about it. In other words, I am content to pull it out of the line-up and recommend it to others. As the title suggests, this book focuses on the subject of baby animals. Each paragraph contains information about an individual animal, telling the reader about certain characteristics. It explains how the baby feeds, when they leave home, how big they will get and, of course, what they are called. My favorite baby animal name is "puggle." (Do you know which animal this is?) I probably like it because it sounds like "Puddle" which is like "Puddleglum" and so I have happy associations. Otherwise, I think puggles are so ugly that they are cute. The closest the book seems to come to talking about the theory of evolution is predictably on the paragraph which discusses baby gorillas. It makes the comment, "The mother licks, picks, rubs and nibbles every part of its body. Often, this makes the baby cry, almost like a human baby, as it kicks to get free." Otherwise, 101 Animal Babies focuses entirely on pictures and basic information. I am happy with it. Many thanks to Scholastic who sent a copy of this title my way in exchange for sharing my honest thoughts.